MingmaNuru Excursions Pvt. Ltd.Trekking Archives - MingmaNuru Excursions Pvt. 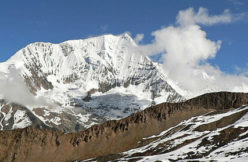 Ltd.
Dhaulagiri is one of the most popular 8000m Peaks for climbing in the Himalayas. 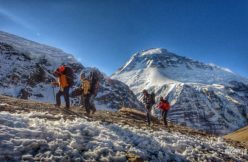 The seventh highest mountain in the world, Trekking around the giant Himalayan Peak Dhaulagiri is one of the most challenging treks. The trek goes through big challenging mountain passes, crossing over French pass (5360 meters) and Thapa..
Rolwaling trek is one of the best trekking areas in Nepal. It offers an outstanding view of the Himalayas that lies along the north-eastern side of the finger land and that juts into Tibet to the north-east of the Kathmandu – Kodari – Lhasa highway. 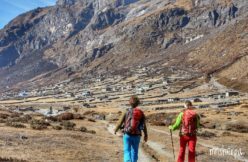 It has an enchanted..
Rolwaling trek is one of the best trekking areas in Nepal. It offers an outstanding view of the Himalayas that lies along the north-eastern side of the finger land and that juts into Tibet to the north-east of the Kathmandu – Kodari – Lhasa highway. It has an enchanted view..
Makalu-Barun National Park, a virtually uninhabited 1500 km2 area of Eastern Nepal, is very close to virgin wilderness. 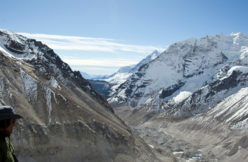 This remote terrain stretches East from Sagarmatha (Mt Everest) National Park, between the high plateaus of Tibet and the deep subtropical gorge carved by the Arun River. There are spectacular views of..
Helambu is a lush region to the North of Kathmandu inhabited by Sherpas and Tamang people although the Sherpas of this region differ in their practices from their cousins in the Everest region. 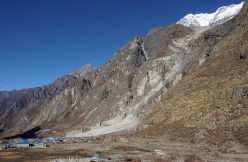 The trek is easily accessible from Kathmandu. 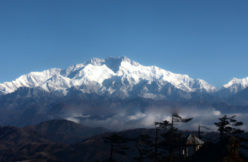 It passes through some beautiful forests and very interesting villages..
Kanchenjunga straddles the border with Sikkim in the remote North East region of Nepal. 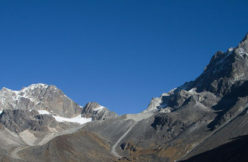 The third highest mountain in the world it is one of the most inaccessible and formidable of the entire Himalayas. The trek in is a long and often an arduous one. 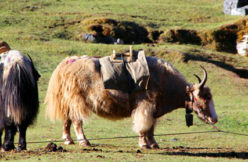 Kanchenjunga's proximity deters all but..
Trekking in the Dolpo region has only been permitted since mid-1989. The region lies to the west of the Kali Gandaki Valley, Dolpo is located inside the Shey-Phoksundo National Park in mid-western Nepal, behind the Dhaulagiri massif, towards the Tibetan plateau. The region offers opportunities to visit ancient villages, high..
Commence with an overland journey to Dunche, the main trading post of the area. From here we spend four days hiking up through this beautiful alpine valley to Kyangjin where we rest for a day for some exploration of the high mountains and glacial systems. We track back for three..
Commence with an overland journey to Syabrubesi thus avoiding a stay at Dunche the main trading post of the area and a town of little character. 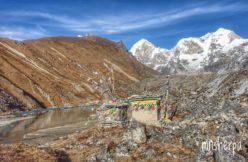 From here, we spend four days hiking up through this beautiful alpine valley to Kyangjin Gompa, where we have two days to explore the.. 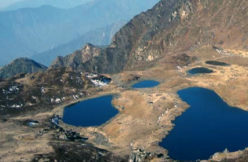 This trek is ideal for people with less time who do not wish to travel too far from the Kathmandu Valley. Helambu is a lush region to the North of Kathmandu inhabited by Sherpas and Tamang people although the Sherpas of this region differ in their practices from their cousins..